At Crystal Chauffeurs we make sure that all our wedding cars are prepared to the highest level of standards for your all-important day. No wedding is ever the same with us as all our bookings are tailor made with you from vehicle types, vehicle decorations and wedding decorations. It’s very important that you choose the right car as your wedding day is so special and one to remember. Our wedding cars will pick you up from any chosen location and take you to the church or registry office then on to reception giving you plenty of time for those special pictures maybe at your location of marriage or park. We offer various wedding packages and options that you can speak to us about and even come see us in person. 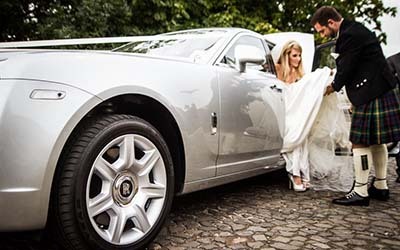 All we expect from you is to sit back in one of our wedding cars, relax and enjoy the ride of your special day. We warmly welcome weddings from all cultures.